See also Memoirs of Samuel Arthur Sackett (1841–1932). Byra G Sackett, Alexis Dunham and Michael Ann Sackett. 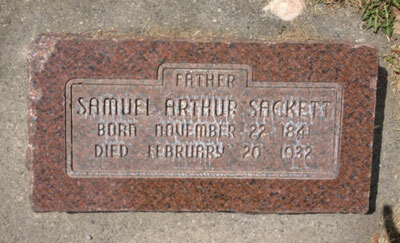 Thurmon King's database, 4186 Samuel Arthur Sackett. "Utah, Death and Military Death Certificates, 1904–1961", digital image, Ancestry.com, "Samuel Arthur Sackett, d. at LDS Hospital, Salt Lake City, 20 Feb 1932, res. 256 Iowa St, res. 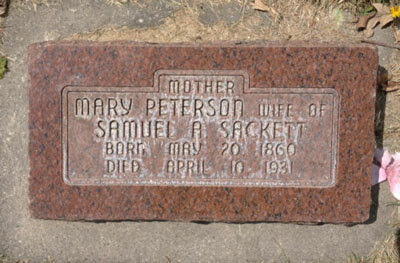 SLC 11 yrs, widowed, wife Mary Peterson Sackett, b. Rockland, IL, 22 Nov 1841, age 90-2-18, carpenter & contractor, self-employed, father Samuel Arthur Sackett b. England, mother's name unknown, informant, Erwin A Sackett, 256 Iowa St, cause brochial pneumonia, senility, bur. Brigham City, Utah, 23 Feb 1932." Salt Lake Telegram, digital image, Utah Digital Newspapers (http://udn.lib.utah.edu). 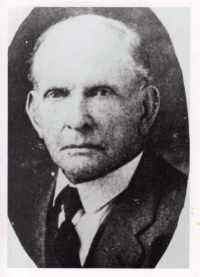 Julia H. Sackett Jones, Samuel Arthur Sackett, Memoirs (1932). Salt Lake Telegram, digital image, Utah Digital Newspapers (http://udn.lib.utah.edu), 11 Apr 1931, p. 15. Cambell, Samuel F, 49?, labourer, b. NJ. Edwin Goodall, 17, b. England. Sackett, Daisy Alberta, 7/12, Dec, dau, b. ID, father b. UT, mother b. UT. Sackett, Orrel D, son, 9, b. UT, father b. IL, mother b. UT. Hudson, Anetta, dau, 42, divorced, b. UT, father b. IL, mother b. UT, dressmaking, at home, own account. Sackett, Althora M, dau-in-law, 27, m. at 23, b. UT, father b. UT, mother b. UT.